The Aberdeen Dining Room Group by Riverside Furniture at Ryan Furniture in the Havre De Grace, Maryland, Aberdeen, Bel Air North, Churchville area. Product availability may vary. Contact us for the most current availability on this product. Rustic elegance with a light industrial flair will transform your living room into a country chic sanctuary with the addition of this Aberdeen collection. 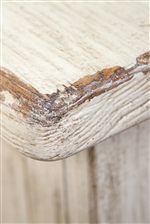 Lightly distressed Weathered Worn white finish brings out the handsome cottage style that you are sure to love. Graceful braces connect the block feet for a stylish finish that will add warmth and brightness to your home. 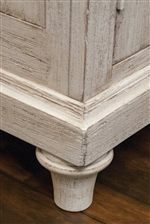 The Aberdeen collection is a great option if you are looking for Cottage furniture in the Havre De Grace, Maryland, Aberdeen, Bel Air North, Churchville area. Browse other items in the Aberdeen collection from Ryan Furniture in the Havre De Grace, Maryland, Aberdeen, Bel Air North, Churchville area.